Previously… on Adventures In Open Source 🙂 About a month ago now I decided to spend a week trying out a few different Linux distros to broaden my horizons and get a feel for the current lay of the land. I was interested in ease of use primarily, something I could offer to a friend to try. In hindsight my choice of distros was pretty stupid, Slackware for instance wouldn’t be on anyone’s list of beginner friendly distros. I didn’t know what it was and I learned pretty fast. So after taking these 10 distros for a spin and spending a lot longer than I’d planned on this journey I thought it would be a good time to recap what I’ve learned and reflect a little. Ease Of Installation & Setup: This is pretty self explanatory really, how easy was it to install and get a fully working desktop on my hardware. Community & Online Support: How easy was it to find support and help on the web. 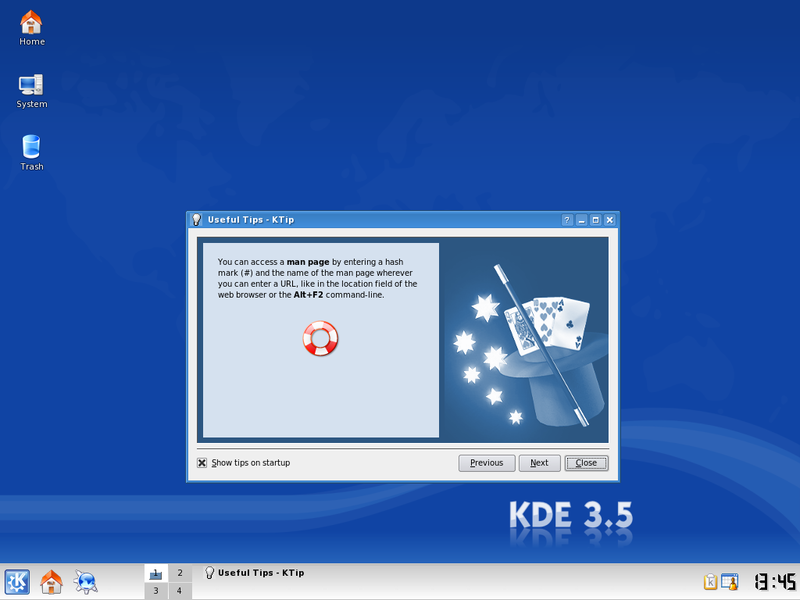 Features: What kind of software did the distro come with, hardware drivers and so on. Anything particularly new or unique to distinguish it. The community is probably the strongest feature of Ubuntu for me. Help is always easy to find online and the response is usually friendly. It’s a definite plus I think. There have been a lot of high profile bugs in Gutsy and while it seemed to be pretty stable in every day use I got the impression that the release date had to be met at any cost. I think the agenda of Ubuntu is to march forward adding new features as fast as possible, this has an obvious trade off with stability for me though. Gutsy is a decent release and I might be a little harsh on it because I expect so much I suppose. Its a good distro for home users and the community is always willing to help out. It is a very stable OS and I think having a large company like Novell with their experience behind it probably helps in this area. You can see that it’s aimed at the business market though I think. I don’t want to upset any SUSE users with the community score, I did find some useful forums but there just didn’t seem to be the wealth of help you get with some distros. I found installing software with Yast wasn’t much fun but the Suse Build Service is a handy feature. 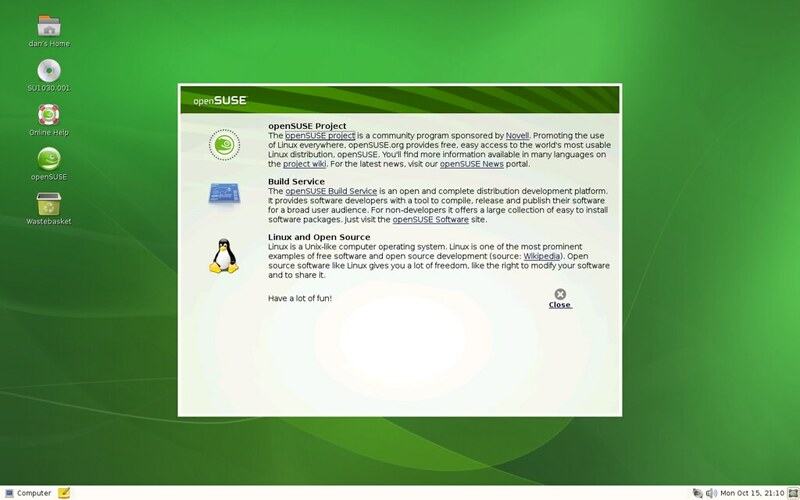 Overall I found configuring OpenSUSE as a home / multimedia desktop wasn’t that easy in comparison to other distros. It would be great in an office setting probably but at home it’s not for me. This really was a revelation for me. 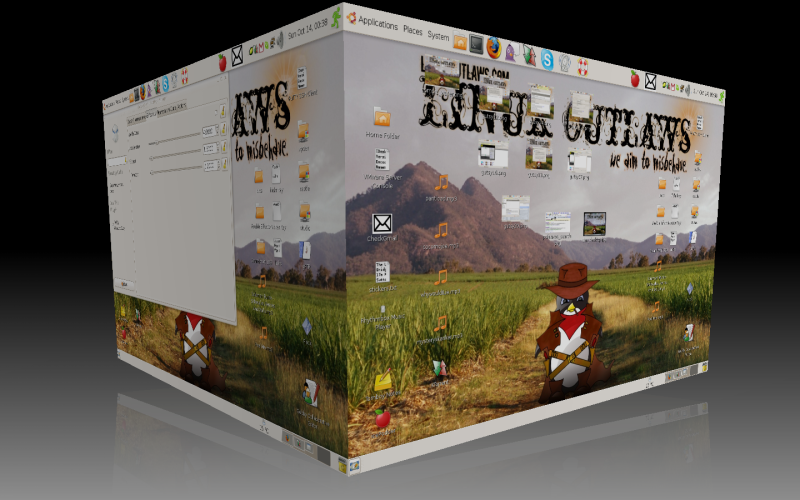 Full 3D support and Compiz Fusion desktop right from the liveCD was impressive. I found the system very easy to use and configure. The software manager wasn’t quite as good as in some distros but I found it easy enough to use. This distro had lots of good features packed in. It did lack NTFS write support out the box which is common in other distros but other than that it was great. Multimedia support was very good. 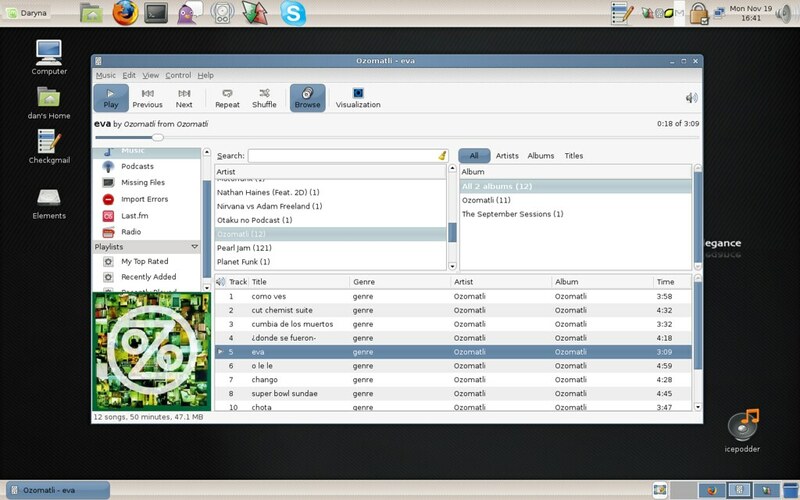 Overall I don’t think you can beat Mandriva 2008 as a newcomers distro. It really does seem to just work out of the box and could be a great introduction to Linux I feel. The system seemed very stable and I didn’t have any crashes or other problems really but it wasn’t quite the out of the box everything works experience I’d heard so much about. The PCLOS community is pretty strong and it’s grown quickly, I didn’t find a wealth of support and reference material in my searches though. The forums seemed very active though and there was a pretty friendly atmosphere. The system came with a good compliment of software but I found getting hold of the video drivers I needed was not straightforward. NTFS and multimedia support were good and there wasn’t much additional software I needed. Overall I found this distro to be pretty average, I’m sorry I know that upsets some people but I had high expectations and I didn’t feel it met them. For a supposedly easy to use distro I didn’t think it was anything special in this regard. That’s not a criticism but if ease of use is what you want you prize most you should look at Mint or Mandriva first in my opinion. Debian has a reputation for being difficult to use but I didn’t find it so at all. I was able to get a fully working desktop pretty easily. There was a fair amount of configuration to do and maybe it’s not for newcomers but really it’s not that hard. Debian isn’t renowned for it’s groundbreaking features with the overall emphasis on conservatism and stability but it had plenty of software out of the box. I did have to do some work to install the video drivers for sure but it wasn’t really anything more than I had to do with openSUSE or Fedora, just to put it in perspective. It’s easy to see why this is a popular server choice. I found it really easy to find tutorials and guides online for Debian, I was surprised by the amount of information available I have to say. I really liked Debian and if the ethics of free software are important to you then it’s a probably the best choice. Not a beginners distribution for sure but I don’t think it deserves it’s “difficult” tag so much any more. It’s no secret that I found Slackware hard going and by rights it probably shouldn’t be in this collection as it’s something quite different and unique. I should have researched it before I took the plunge but meh. It’s an incredibly stable distro it has to be said and while you basically have to do everything yourself a lot of people like this approach. It’s not for newcomers make no mistake but if you want to learn how the real nuts and bolts of Linux go together then this can be very educational. Be prepared to get your hands dirty though. 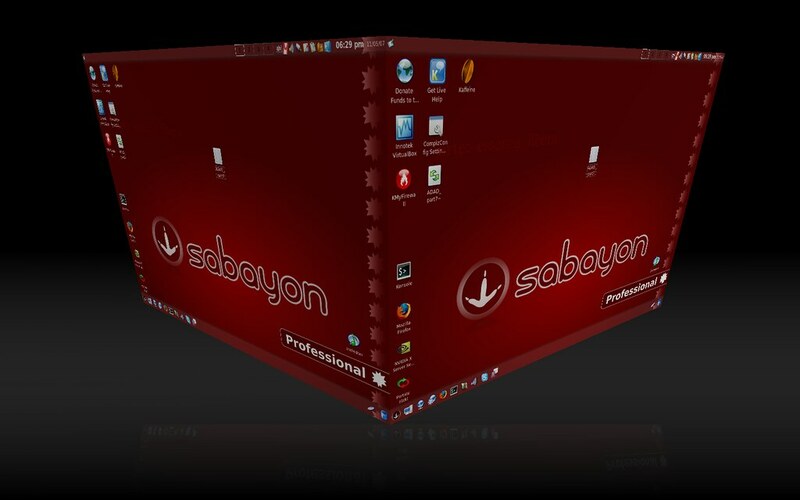 I found Sabayon took a while to install because of the sheer amount of software it comes with. The process was easy to do though and shouldn’t phase many users. It was pretty stable but the update system could confuse some people and it’s easy to break your system with an ill advised merge command. The community was very helpful and while not the biggest the documentation and support was very good. 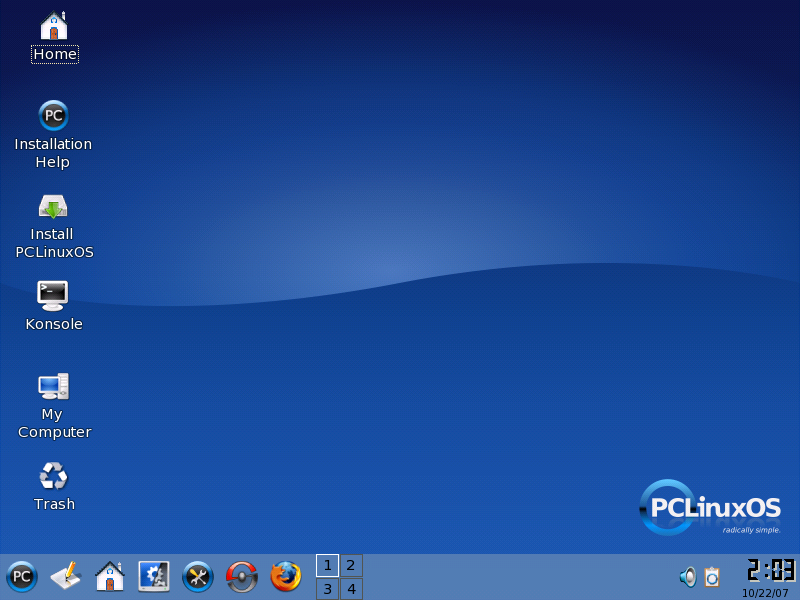 The system came packed with features such as VirtualBox, Skype and other things but it did seem a little bloated to me. One of the largest Linux installs I’ve done at 9Gb but it ran pretty quickly on my hardware though the insitial booting was slow. It will be interesting to see how this develops in the future as it’s an exciting distro, if you want a one hit office machine then it could be well worth a look. 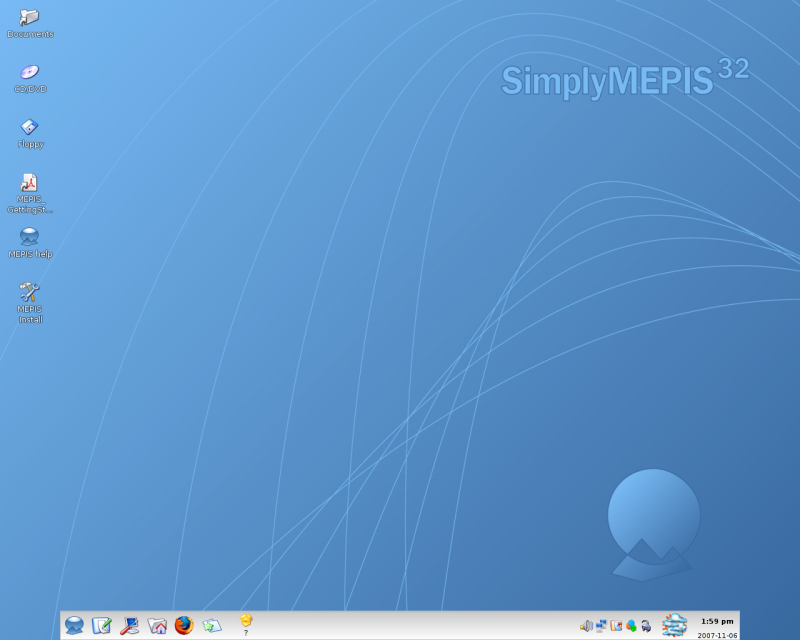 simplyMEPIS was very easy to install I thought and it certainly tries to be as easy as possible but I didn’t feel it was quite as foolproof as Mandriva or Mint in the end. It was a very stable system though and it seems the developers prise stability very highly. There seems to be a very close nit community around MEPIS and while it wasn’t so easy to search for good guides I did find the forums very responsive. The atmosphere was friendly and helpful. The system didn’t quite seem to have as many impressive features as some other distros but it did come with a good compliment of software. I found the community repos contained the latest versions of packages like Skype which was very helpful. If you want an easy to use distro that maintains stability then this is a good option but for absolute newcomers it may not be the right choice I don’t think. I found Fedora was a little difficult to configure with things like video drivers, I know this may be down to the fact that non-free software is discouraged in Fedora but it still doesn’t change the facts. I had a lot of trouble with the package manager locking itself and causing problems which affected the overall stability for me. I think progressive features take higher precedence over stability here in a similar way to Ubuntu. There are some really nice features here though such as Pulse Audio and integrated virtualization support. I get the impression that it’s something for enthusiasts or people who really want a Red Hat system for whatever reason. I don’t think I would recommend it to a newcomer but it certainly has some interesting innovations to offer. I found Mint was incredibly easy to install and set up, it would be great for a beginner I think. It’s very user friendly and most of the set up is done for you which is nice for newcomers. It seemed pretty stable but it iss based on Ubuntu Gutsy and since I didn’t give that very good marks for stability I suppose that has to be taken into account. The community support was good and I found quite a few decent guides online. I’ve given it a high score for features because the developers have really added a lot of stuff to the Ubuntu base such as the Software Portal, MintUpdate, MintAssistant, MintUpload and more. It’s a really great distro and perfect for beginners but I think there is also plenty here to keep more advanced users happy too. I feel that having done this little tour I have a better appreciation for the diversity and choice you can find in the Linux world. There is a distribution for pretty much every application and taste it seems. If you are a newcomer to Linux and want a nice introduction then I would say Mandriva 2008 or Linux Mint 4.0 are the best for this. You can learn on other things of course and this is personal opinion but I found them to be the easiest and most friendly to novices. If stability and open source ethics are your thing then Slackware and Debian offer a great deal. I didn’t find Debian that hard to use and I learned that a lot of the things I love about Debian-based distros are actually inherited from the old master. Slackware is a challenge but for stability and security it’s hard to beat and if you want to really learn about the building blocks of Linux it’s probably for you. Sort of like fixing your own car instead of getting a mechanic, no doubt you learn more if you have the time and interest. If you need to set up an office machine then I would say openSUSE or Sabayon Professional were the best of the selection I tried for this. You can make an office machine with pretty much any of these distros of course but these seems tailored to it. openSUSE particularly seemed to be made for large offices with Windows domains which is no surprise really. I think this distro hopping has become addictive, I’ve gotten used to just backing up my data and traveling light, so I’ll continue to try out new distros as I go. What I may do in the long term though is get another machine just for testing and then probably settle down with Debian. I love the philosophy of the distro and I found it very comfortable to use, I think it’s the one for me but I haven’t given up looking quite yet. I guess you could say I’m playing the field hehe 🙂 Care to join me for more adventures? I will be trying Pardus 2007.3 next which is a distro I’ve heard quite a bit about and I’m anxious to see what it’s like, fasten your seat belts this journey is not over yet…. Thanks for all of this Dan. As someone who hasn’t touched Linus in years I am encouraged. I shall start with Mint but I feel well informed know about the obvious possibilities. Hey Dan, I’m a continuous follower of your steps. according to me the best distro that is good for a newer is fedora. even if its not the most rated one, it has all the features of a GNU/Linux. Power , Control , Stability. Even if there are some distros that tops these features, it does not contains an average of Everything. I don’t gets that kind of a control from most distros. and also, We don’t need to compare the features with Windows to the Linux. it should have its own identity and it should always have the control of the Linux Core. not just the GUI. Even for a newbee, he must feel the Power and the control of the User that has over the OS. and he should also learn that the GNU/Linux is not about pirate, there should be some limitations to the ethic issues too. and also he should learn to do something its own too. suerly we dont wanna population that uses GNU/Linux , but knows only to do Word processing. So there should be some limitations to the GUI also. Simply Saying : We Don’t Want any other OS like XP. we already has it. So I would say Fedora 8 would be a nice distro for a newbie. but These all are only My opinion. So no hard Feelings. Any way I’m appreciating your Work as Much as possible. Thanks for all of the thoughtful reviews. Some unfortunate stability and graphics issues after upgrading my current distro convinced me to start the search for the perfect distro again. As you point out, what’s “perfect” depends on the person and setting. That view, combined with your willingness to recklessly throw yourself under the wheels of distro after distro, is what’s made your reviews such a great read. I look forward to future installments. ps: I settled on the KDE version of Mint for now, although sidux also looks like it has potential for someone who wants to be more faithful to the Debian core. This has been a lot of work and I appreciate how much you’ve been through just to help us learn. Some of these distros were new to me, so it will be fun checking them out. I tried gOS a few days ago and it was more fun than I expected. Hi Dan, i’ve been following your blogs and is kindda home page for me. I begin my day by visiting your site in a hope to see a new review. Great work. I’ve a spare machine however do not have enough bandwidth (time as well as broadband) to join your force. Maybe, someday, i will. very good round-up to your previous blog entries. after 2 weeks of linux mint (and that´s an ETERNITY for a distro hopper like me, i opted in to other alternative platforms. after some days of ZETA (r.i.p) i´m now on eCS, the successor of OS/2. Great distro list, Dan. Also consider installing ZenWalk. It’s simple, easy to setup, and is a good distro for beginners. Keep up the great work. Hi Dan. I have been reading your reviews of different distros. Every day I check this blog hoping for something new. I have been using Linux Mint for about 3 weeks and it feels like it is made for me. I guess I am sticking with it for a while. Exceptional job Dan, to think you did all this and kept your sanity reasonably intact. This has to be the definitive distro rundown and for newbies like me has been an invaluable resource. It’s interesting to see just how closely your comments mirrored my own thoughts when I installed many of the same distributions. That said, I would add that Mepis’s biggest strength is that it’s essentially a Debian installation with all the configuration done for you up front. It’s rock solid in my experience, but boring, and a little too auto-configured for my personal taste. The Mepis forums, however, are very newbie friendly, and less prone to fanboyism. It’s a very mature and proper distribution. Like you, I was also impressed with Mint. As a former Ubuntu user who has been burned by bugs a number of times, I was loathe to try anything that had an Ubuntu base. However, Mint has proved time and again, to be among the easiest installations and most stable platforms out of the box on my old Sony laptop with a Broadcom PCMCIA wireless card and an ATI graphics card that almost always gets configured incorrectly. It also seems faster than Ubuntu on my machines than Ubuntu. It’s my number one distro when I just don’t want to spend days finding out how to get support for my hardware. I would second (third?) the comments made by a couple of other readers in that you would do well to review one of the Slackware derived distributions. They provide the speed and stability of Slackware, with a little more help to get you up and running. 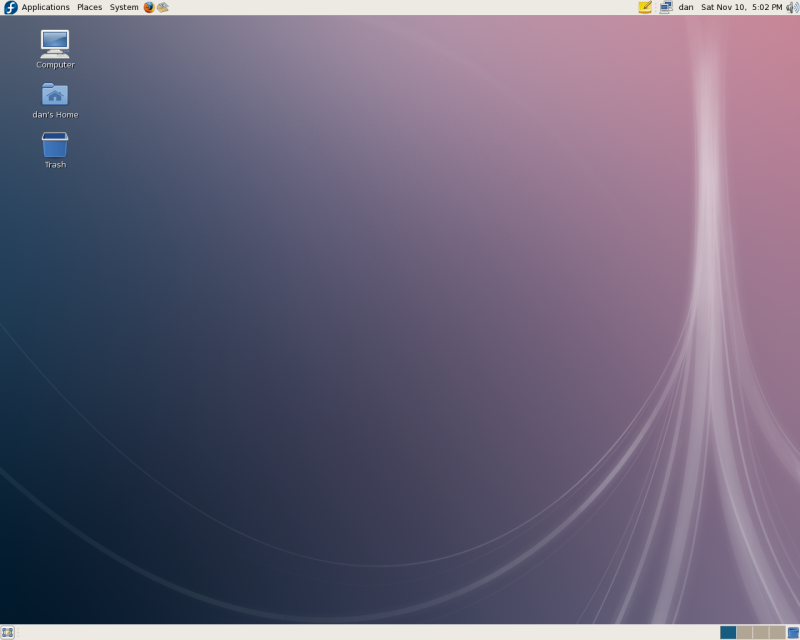 Zenwalk is a personal favorite, but Vector Linux and Wolvix are also quite good — and fast. Great reviews. Keep up the good work. Just wanted to say that these reviews are really helpful. I came to a point where I wanted to get all my machines off windows but couldn’t decide between the dozens of distros available. This put the top few together and helped me figure out what I really needed.